Sunday was a day of ferries, upon which I planned to reach the Isle of Mull via the mainland port of Oban. My legs were looking forward to a rest after the previous two days. I left the hostel in time for the 9:20 ferry, saying my goodbyes and feeling slightly sorry for those who were cycling or walking into the still foul weather (Not too sorry though as most would be heading north with the wind on their backs). I took Grey Mouse into my hand-luggage this time, having been a bit worried on the Eriskay crossing yesterday. If the sea got too rough and we had to abandon ship, how could I leave my mouse to drown? (He has no arms and it's hard to tread water with two stubby little legs and one ear). You have to consider these things. A lady at the ferry port waiting room caught sight of him in my handlebar bag and smiled. He'd have smiled back if he had a mouth. The crossing was rough to start with. 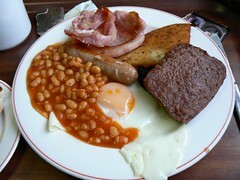 I'd ordered a full Scottish breakfast at the ferry cafe and had trouble finishing it. Scottish breakfast is much like an English one but you get a square sausage (apparently very convenient in sandwiches made from square loaves) and a potato cake. The boat reached Oban, the wind thankfully having died down a lot, and the sea become a lot calmer. I had business to attend on the mainland, with access to both a mobile phone signal and a railway station I was able to re-book the journey home. I'd hoped for a Friday night train, giving me five days to get back to Kyle of Lochalsh, but ended up with just three (apparently getting bicycle space at such short notice is rather hit and miss). My second ferry of the day took me to Craignure. It was half past four when we arrived, and I'd usually be thinking about finishing up around the time, but once I hit the road it was hard to stop. It was so wonderful to be freewheeling, coasting, moving at speed again and, although it was raining a bit, the road was rather pretty, with fantastic views across to Ardnamurchan. The rain soon stopped, the sun came out and after about ten miles I started to look for wild camping spots. I'm not very good at that and have a bit of a hard time getting into the mentality of "Hey, I'll just stick my tent there!". 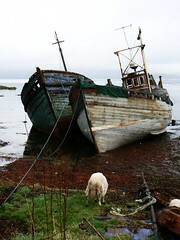 Nothing good came up, everything looked too bumpy, slopey, squishy or fenced off and I eventually got to Tobermory. On the way into town I caught up with three other cyclists, two men up front and a woman a couple of hundred yards behind. I pulled in behind the lady and started chatting about our respective travels. They were heading for a pre-booked B&B in Tobermory. I think she got a bit annoyed with me and invited me to overtake. I found a hostel in Tobermory but it was full. According to the lady at the desk there were a lot of people looking for budget accommodation that night, and that's when I remembered it was a bank holiday weekend, which is always fun when you're touring. It probably didn't help that Tobermory is also known as Balamory, of kids' TV programme fame, which probably makes it a great spot for people to take their kids on bank holidays. I headed back up the (rather big) hill and continued down the road until I found the local campsite, which was busy but not full. It was about half past eight by then so I covered up with midge-repellant and started simultaneously pitching the tent and boiling water for dinner.